Visiting Tapia de Casariego and looking to get a place to swim? Nice option! Don't neglect to tell us how did it go. Introducing now Piscina de agua salada La Cetárea swimming pool, a terrific swimming pool sent by a swimmer like you few days ago. Have you visit this pool? Do you work here? Please, contact us if you have information which you think is gonna be useful and recall from now on you could now promote each pool just by sharing this page with your buddies or adding comments in the Facebook boxes below. 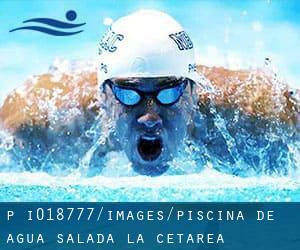 Come on and support this pool to be the very first in Tapia de Casariego! Among all of the activities supplied by the center, if you are considering swimming you might get pleasure from outdoors, Salt Water, Non-Chlorine Sanitized. Just in case you wish to get in touch with this Pool just before dropping by, we only know the phone number. Ever been in Tapia de Casariego? If you believe that any of the facts is incorrect, please get in touch with us. Enable us be better day-by-day. Updated on 2019 Calle Jovellanos, Junto a Guarcia Civil , La Felguera , Langreo , Spain (Postal Code: 33930). Swimmers like you reported 25 meters x 17 meters, 8 lanes, Indoors. Unfortunately we do not have the email address of this Swimming Pool, but we can provide you with the phone number. Oviedo. Swimmers like you reported 25 meters x 12.5 meters, 6 lanes, Indoors. Phone number and e-mail address are number for this Swimming Pool. Updated on 2019 C/ Sabino Álvarez Gendín 14 , Aviles , Spain (Postal Code: 33402). Among all the activities offered by the center, if you're enthusiastic about swimming you'll take pleasure in 25 meters x 16.67 meters, 8 lanes, Indoors. Just in case you desire to contact this Swimming Pool before dropping by, we only know the phone number. Updated on 2019 Avenida de Julián Clavería , Oviedo , Spain (Postal Code: 33006). Swimmers like you reported 25 meters x 12.5 meters, 6 lanes, 1.3 meters - 1.8 meters depth, 1.3 meters - 1.8 meters depth, Indoors. Phone number and e mail address are number for this Swimming Pool. Updated on 2019 Carretera de Arenas , Santianes de Terrón , Arriondas , Parres , Spain (Postal Code: 33540). This sports center delivers 25 meters x 12.5 meters, 6 lanes, 1.2 meters - 1.8 meters depth, 1.2 meters - 1.8 meters depth, Indoors. For this Swimming Pool, only phone number is number here. Updated on 2019 Calle Ramón Areces, 7 , Gijon , Spain (Postal Code: 33211). Swimmers like you reported 25 meters x 12.5 meters, Indoors. Unfortunately we do not have the email address of this Swimming Pool, but we can give you the phone number. Updated on 2019 Paseo Marítimo Marq Santulla, 33130 Muros de Nalón, Asturias, España. This sports center offers Olympic size, Outdoors, Salt Water, Non-Chlorine Sanitized. Contact info for this Swimming Pool for example phone number and email address are number. Updated on 2019 Avenida Juan Carlos I , Gijon , Spain (Postal Code: 33212). Swimmers like you reported 25 meters x 12 meters, 6 lanes, Indoors. Unfortunately we do not have the e-mail address of this Swimming Pool, but we can provide you with the phone number. Updated on 2019 José María Martínez Cachero, s/n , Oviedo , Spain (Postal Code: 33013). Few days ago a typical user of this center told us they offer Olympic size x 21 meters, 7 lanes, 1.8 meters - 2.5 meters depth, 1.8 meters - 2.5 meters depth, Indoors. Furthermore, they keep in good conditions 20 meters x 10 meters, Indoors. For this Swimming Pool, only phone number is number here. Updated on 2019 La Corredoria s/n , Oviedo , Spain (Postal Code: 33011). This sports center offers 25 meters x 12.5 meters, 6 lanes, Indoors. For this Swimming Pool, only phone number is number here. Updated on 2019 Avenida Luxemburgo , Oviedo , Spain (Postal Code: 33011). Among all of the activities provided by the center, for anyone who is interested in swimming you will take pleasure in 25 meters x 16 meters, 1.4 meters - 1.7 meters depth, 1.4 meters - 1.7 meters depth, Indoors. Just in case you desire to get in touch with this Pool prior to dropping by, we only know the phone number. Updated on 2019 Avenida de El Llano, 69 , Gijon , Spain (Postal Code: 33209). Swimmers like you reported 25 meters x 16 meters, Indoors. Unfortunately we do not have the email address of this Pool, but we can give you the phone number. Updated on 2019 Avenida Jesús Revuelta s/n , Gijon , Spain (Postal Code: 33203). Few days ago a standard user of this center told us they offer Olympic size, 8 lanes, Indoors. Furthermore, they keep in good conditions 25 meters, 6 lanes, Indoors. Contact facts for this Swimming Pool for instance phone number and email address are number. Updated on 2019 Calle Camino del Lucero , Gijon , Spain (Postal Code: 33212). Few days ago a frequent user of this center told us they offer Olympic size, 8 lanes, Indoors. Furthermore, they keep in good conditions 25 meters x 12.5 meters, 6 lanes, Indoors. Contact info for this Swimming Pool like phone number and email address are number.